China’s new buzzword, tuhao, may be in next year’s Oxford English Dictionary. The word caught the attention of the dictionary’s editing team after BBC’s recent program on influential Chinese words. "If its influence continues, it is very likely to appear on our updated list of words,” said Julie Kleeman, project manager with the editing team. Kleeman told the Beijing Youth Daily that tuhao has some similarities with the English word bling, which refers to expensive, ostentatious clothing or jewelry. Both the words have existed for long but later on took a new meaning. 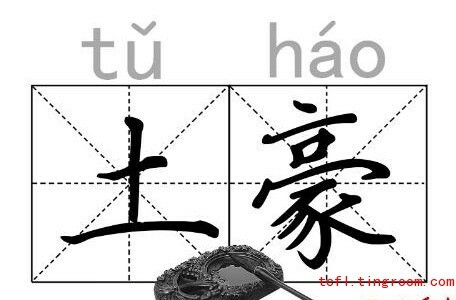 In Chinese, tu means uncouth and hao means rich. It has traditionally been referred to rich people who throw their weight around in China’s rural areas. In recent years, people in the ACG (anime, comic and game) circle borrowed the term to describe those who spend money in an irrational manner. The word is now often used by the online community to refer to people who have the cash but lack the class to go with it. Kleeman also mentioned two other Chinese words — dama and hukou — which may also make it into the dictionary. Hukou means household registration in Chinese and has been widely used by Xinhua news agency and China Central Television. It has become a hot word in recent years because of its links with corruption cases. Dama, meaning middle-aged women, was first used in the Western media by the Wall Street Journal in May when thousands of Chinese women were buying up record number of gold. They were the driving force in the global gold market between April and June when the gold prices had slumped. Lianghui is another Chinese word that may be included in the dictionary. It is actually a Chinese abbreviation for the National People’s Congress and the National Committee of the Chinese People’s Political Consultative Conference. The domestic media have been using lianghui regularly and overseas media have followed suit. People can have an “intuitive” grasp of the meanings if they see pinyin, Kleeman said, adding that people avoided using an English word to retain the original meaning. "We have nearly 120 Chinese-linked words now in Oxford English Dictionary,” she said. Some of them are: Guanxi, literally meaning “connection,” is the system of social networks and influential relationships which facilitate business and other dealings. Dim Sum originates from Cantonese dialect and refers to a Chinese dish of small steamed or fried savory dumplings containing various fillings. Taikonaut is a mix of taikong, meaning outer space, and astronaut. The new words will be first uploaded on the official website before the dictionaries arrive. The online version is also renewed every three months. "It at least broke our old rules. It used to take 10 years to include a new word but now we keep the pace with the era,” according to a statement issued by ex-chief-editor John Simpson.